Bringing Up Baby | Hidden Brain This week we focus on the behavior of the youngest members of the human race. We try to translate the mysterious language of babies. And we ask, when should we step back and just let our children be? For more information about the research in this episode, visit https://n.pr/2TuxEz3. Hey, there. Shankar here. Quick note about today's episode - this show is what we call a radio replay, meaning it's one that we recently put out on the radio version of HIDDEN BRAIN and have decided to drop back into our podcast feed. It features a podcast episode from last May called Baby Talk. We love the story because it gives us new ways to think about how to communicate with small children, plus the sounds of babbling babies are incredibly cute. The second half of the show features a 2017 episode called Kinder-Gardening. It's a conversation with psychology professor Alison Gopnik who makes the case that less really is more when it comes to parenting. Hope you enjoy it. We'll be back next with a new episode. VEDANTAM: This is HIDDEN BRAIN. I'm Shankar Vedantam. There's a video on YouTube you might have seen. It has nearly 200 million views. In this video, a pair of twin brothers are standing in a kitchen having a little chat. VEDANTAM: ...Are diaper-clad babies. Now, if this video featured 10-year-old twins or adult twins, I guarantee you it wouldn't have gone viral. What makes this video special is that we have no clue what these babies are saying. To us non-babies, it sounds like gobbledygook - cute, mysterious gobbledygook. VEDANTAM: Here at HIDDEN BRAIN, we love trying to understand the puzzles and contradictions of human behavior, but we spend most of our time talking about the older members of the human race. Today, we focus on the younger set - the much younger set. VEDANTAM: Later in the show, we'll hear from a researcher who says parents are often misguided when they try to steer their children's lives. ALISON GOPNIK: If you just do the right things, get the right skills, read the right books, you're going to be able to shape your child into a particular kind of adult. VEDANTAM: But first, we'll start with the language of babies, even babies who don't speak words. VEDANTAM: When Laura was in college, she spent her summer vacations back home in Sudbury, Ontario. And she worked at the Magical Nook, a day care center. CIRELLI: It was a large center that had different age groups, so there was a baby room and a toddler room, preschoolers, school-age children. But my favorite room was the toddler room for sure. VEDANTAM: Laura's job was to help the teachers at the center engage with the kids and enforce the rules. VEDANTAM: Music was an essential tool. CIRELLI: We would sing "Wheels On The Bus..."
UNIDENTIFIED SINGERS: (Singing) The wheels on the bus go round and round. UNIDENTIFIED SINGER #1: (Singing) Old MacDonald had a farm, E-I-E-I-O. CIRELLI: If we didn't sing the clean up song with the preschoolers, then I don't think anything would have ever gotten cleaned up. CIRELLI: But as soon as we started, it seemed to be the trick to convince them that, yes, they were willing to put their toys away. UNIDENTIFIED ACTOR: (As Baby Bop) Such a mess. VEDANTAM: Laura regularly found herself in awe of the toddlers. CIRELLI: One little kid who I had a good connection with, she grabbed my hand and brought me over to the little slide, and she really wanted to go down the slide. You could tell. So I helped her up the little stairs, and I caught her at the bottom of the slide. And all the rest of the toddlers in this playground just looked over and saw her and looked at each other and then ran over to the slide and formed a cute little lineup waiting their turn for me to help them down. VEDANTAM: Laura's days at the Magical Nook are over. She is now a professor at the University of Toronto Mississauga, and her work focuses on early childhood development. With years of knowledge now under her belt, she looks back on that moment at the slide and sees it as a form of communication. CIRELLI: In order for kids to look around and see what their peers are doing and to understand the goals that are embedded in those activities and to then realize that they need to follow the social construct of lining up, it seems like a super simple thing, but there's a lot of understanding about themselves, about other people, about goals and activities that they need to really completely understand in order for that to happen. VEDANTAM: Laura says actions like standing in line for the slide can be categorized as prosocial behaviors. They're actions we take to help others and to benefit the group. She decided to study what she'd seen on the playground more systematically. She invited a bunch of parents to bring their toddlers into the lab. VEDANTAM: These 14-month-olds said bye-bye to Mommy and Daddy and then were strapped into front-facing baby carriers worn by assistants in the study. The researchers turned on some music. CIRELLI: Usually, it was "Twist And Shout" playing the background. CIRELLI: It was like (rhythmic clapping) so we would bounce them down on one beat and up on the other, down and up sort of thing. VEDANTAM: So if you're this baby, you're strapped onto someone's chest, you can't see their face. Instead, you're looking in front of you at another assistant. CIRELLI: The person facing the baby would either move in synchrony with how they were being bounced, so they're bouncing together, or they would move either too quickly or too slowly so that their movements weren't aligned with what the baby was experiencing. VEDANTAM: ...And then pretend like the object was out of reach. CIRELLI: She would reach pathetically for them for about 30 seconds. And we looked to see what the babies did in this really weird situation where this person they just met needs help but isn't really asking for help and doesn't really seem to be able to achieve their goal on their own. VEDANTAM: Laura measured how many babies would pick up and hand back the objects. CIRELLI: And looked at whether the babies who we bounced in sync with helped at a different rate than the babies we bounced out of sync with. VEDANTAM: She found that babies who felt that they were bouncing in sync with a dance partner were more likely to help that partner pick up an object when it was out of reach. It was remarkable. CIRELLI: So they would help on over half of the trials if we moved in sync with them, whereas if we moved out of sync with them, they would help on less than a third of the trials. VEDANTAM: You've likely experienced the same drive if you've ever moved in sync with someone else, maybe on a sports team in school or in marching band or maybe, like Laura, as a dancer. VEDANTAM: This song was the soundtrack of Laura's last recital in high school, when she dressed up as Mrs. Potts for a performance of "Beauty And The Beast." CIRELLI: There were many numbers in the performance. But in the "Be Our Guest" performance, everyone comes together, all the little kitchen utensils and everything. And we do have to really synchronize at certain parts of the dance. And so when you're experiencing that, you really feel like you're part of this bigger group. And you're focusing on doing all of these steps, but that's become quite automatic at this point. And instead, you can really sort of feel the connection with your co-dancers, and you start to just ignore the audience completely because you're part of this bigger thing. UNIDENTIFIED ACTORS: (As characters, singing) Come on and lift your glass. You've won your own free pass to be our guest. VEDANTAM: Laura's fellow dancers remain some of her closest friends to this day. CIRELLI: I'm going to be the emcee at one of their weddings in September (laughter). So yeah, we - we've definitely stayed very close. VEDANTAM: Music and dance create bonds because, as Laura says, synchronous movement is a language of its own. This unspoken language can guide behavior even though many of us are not familiar with its syntax and vocabulary. CIRELLI: I think music is providing a really interesting context where a lot of social cues are happening. So when we're moving with other people, when we're doing familiar things and singing familiar songs, these are actually cueing us, babies and adults, to think about the relationships that we have with these people. CIRELLI: We think about teaching our kids to be prosocial and to be good citizens, but they're already attending to this information from a really early age. VEDANTAM: The toddler experiment also shows that kids who can't speak are still hungry to communicate. When a small child reaches out to pick up a marker or a paper ball, she may be saying, I like you. I want to help you. Let's be friends. CIRELLI: I find babies are so impressive. We can't really ask them what they're thinking. We have to come up with clever ways of figuring out what's going on in their little brains, and everybody underestimates them. VEDANTAM: Music and dance aren't the only ways adults and small kids communicate with one another. There's another language that actually sounds a lot like language. RACHEL ALBERT: The traditional way of looking at babbling, even as recently as 15, 20 years ago, was really that it was just motor practice, that it had no bearing on later language. It was just something babies did to exercise their mouths. VEDANTAM: This is Rachel Albert. ALBERT: I am an assistant professor of psychology at Lebanon Valley College in Annville, Pa.
VEDANTAM: She studies infant language development. Those, quote, unquote, "traditional views on babbling..."
VEDANTAM: ...Rachel says, toss them out. ALBERT: When babies babble, they're indicating that they're either in a heightened state of arousal, or, by actually babbling, they're increasing their arousal level and putting themselves in kind of this optimal state of being ready to learn over and above than if they were just quietly looking at an object. VEDANTAM: Rachel says babbles have a certain je ne sais quoi. VEDANTAM: When she hears a baby babble, she's taken back to high school French class. ALBERT: And I had one of those immersive French teachers who would only speak French in the classroom. And so it was really like being dropped into a non-native environment where you have to kind of figure things out. ALBERT: ...And pointing and labeling particular objects in the room. ALBERT: So she would, in French, be kind of pointing and saying, you know, are you sitting in a desk? ALBERT: ...And kind of repeating those key vocabulary words until we started to figure out, oh, OK, this is the word for desk. ALBERT: And I thought, well, this must be somewhat similar to what a baby experiences - right? - where there's all this conversation going around. UNIDENTIFIED PEOPLE: Blah, blah, blah, blah, blah, blah (ph). ALBERT: They start to become active communication partners and trying to engage in that world, but how do they make sense of it? VEDANTAM: Parent's often see themselves as the know-it-all French teacher and the babbling baby as a clumsy student. Rachel says this framework is the one that's mostly used in studying infant language development. ALBERT: But the baby is playing as much of a role in this interaction as the mom. By changing the way that they babble and what they're looking at might actually be changing their opportunities for learning because they're changing what the parents say. It's kind of what we call a social feedback loop. So when the baby babbles, Mom responds. The way Mom responds actually will change in real time what the child says next. And they go around and around in this conversation, influencing each other. VEDANTAM: There's a word to describe a back-and-forth exchange where the thing that one person says affects what another person says. This feedback loop of communication and learning is what we call language. VEDANTAM: Babies make as many as a thousand vocalizations every day. On average, parents respond to about 60 percent of these babbles. ALBERT: Even just silently responding - if the mom just acknowledges the infant's vocalization with a touch - leans in, smiles and touches the baby - the infant will immediately, within the span of just 10 minutes, start to produce more speech-like vocalizations. So just that nonverbal feedback, that acknowledgement of the baby's vocalization changes, in the moment, how they're babbling. VEDANTAM: Rachel says that when babies are babbling, they are more receptive to new information. Parents can take advantage of this by having conversations with their baby. And one rule of being a good conversationalist - stay attentive to what your partner is saying. ALBERT: So parents that are just talking constantly about irrelevant things that aren't what their child's looking at - for example, if a baby is looking at a ball and I'm talking about this cup over here that I'm playing with, well, you're actually providing mismatching information for them. That's going to make it harder to learn. VEDANTAM: Rachel says, if you listen closely, babbling often falls into four distinct categories. They have different sounds, and they elicit different responses. ALBERT: QRV is the least mature infant vocalizations. It stands for quasi-resonant vocalization. And so it's those really kind of nasal, creaky ehh (ph) kind of - sounds that a lot of times parents interpret almost as fussing. ALBERT: So that's a fully resonant vowel. And around 3 or 4 months, the baby's vocal tract opens up, and then they're able to produce those more open, kind of adult-like sounding vowels that kind of have those ohs or ah quality. And so parents recognize those as more speech-like than those first, creaky nasalized vowels. And so they're more likely to respond to those. ALBERT: So that's a marginal syllable. And babies will start, around 6 or so months, throwing consonants into the mix. So you can hear in that sound, there's kind of a D-J kind of juh (ph) sound. ALBERT: But it's a slow, drawn-out transition between when the consonant stops and when the vowel begins. ALBERT: ...A mom would be very likely to respond - oh, you - oh, that's a ball. Yeah, you're right. That's a ball. You tried to say ball. That's great. VEDANTAM: ...She simply can't stop herself. ALBERT: On my wedding day, I remember very distinctly - I was in graduate school at the time and knee-deep in coding this all the time, spending hours listening to these different sounds. And I remember being up at the front of the church about to say my vows and hearing some babies out in the audience babble and kind of immediately coding it and going - oh, that was a marginal syllable - and then thinking - no, focus. This is a very important moment. You're supposed to be attending to what your pastor is saying. But I couldn't help but have my attention pulled by the baby in the audience and trying to code what she was saying. VEDANTAM: You don't have to memorize all the jargon to take away something valuable from the research. Just knowing that when babies are babbling, they're ready to learn - that can be a useful takeaway for everyone. VEDANTAM: When we return, we discuss two final elements of baby language. One is going to make you very happy. The other? Well, that's something you don't want to hear as you're saying your wedding vows. VEDANTAM: This is HIDDEN BRAIN. I'm Shankar Vedantam. And we begin this next segment with a warning - if you're driving or listening to this story while cooking, you're about to hear something very distracting. VEDANTAM: This is Katrina Doudna of Sunnyvale, Calif. It's dinnertime. She's throwing a tantrum because she wants to sit at the head of the table. VEDANTAM: Problem is the table's round. There is no head. NOEMI DOUDNA: When she was in the midst of a tantrum, she'd picked something that she knew was completely unreasonable. (Imitating tantrum) I don't want my feet. Take my feet off. I don't want my feet. I don't want my feet. VEDANTAM: That's Katrina's mom, Noemi. She talked with me a number of years ago about her then-3-year-old daughter. N DOUDNA: I once teased her, which turned out to be a big mistake. But I once said, well, OK, let's go get some scissors and take care of your feet. (Imitating tantrum) No. MIKE POTEGAL: My curiosity was focused on what are the elements of the tantrums, you know, the snips and snails and puppy-dog tails or what. POTEGAL: It's Mike Potegal. I am currently an associate professor in the program in occupational therapy at University of Minnesota. VEDANTAM: Mike was inspired to study tantrums after witnessing his own daughter's operatic meltdowns. POTEGAL: Among the things that I learned from that was that there was a sequence in which various behaviors appeared, various behaviors of which tantrums are composed. VEDANTAM: He's a psychologist at the University of Connecticut. GREEN: We developed a onesie that toddlers can wear that has a high-quality wireless microphone sewn into it. Parents put this onesie on the child and press a go button on the equipment. VEDANTAM: And then they waited for a meltdown. James and Mike recorded more than a hundred of them. And what they found confirmed their hypothesis. POTEGAL: There are two major - I think of them as emotional behavioral components of tantrums. VEDANTAM: The first is anger. POTEGAL: Hitting, kicking, screaming, throwing things, pushing and pulling. VEDANTAM: And the other component is distress. POTEGAL: Whining, crying, throwing the self down - that is, dropping to the floor - and comfort-seeking. VEDANTAM: Don't confuse these components with stages. Mike says the behaviors occur simultaneously. The distress is more consistent. POTEGAL: Throughout the tantrum, from its beginning to its end. VEDANTAM: The anger punctuates the tantrum. It provides the dramatic spikes, and it also tapers toward the end. POTEGAL: In every case, the anger terminates before the distress. VEDANTAM: Mike says there's a reason that most tantrums end with a distress call. POTEGAL: Because the distress, sadness, tends to elicit comfort-giving. And so it would make sense from an evolutionary perspective if the anger, which is disruptive, is smoothed over by the distress component, which then, other things equal, will call for a parent comforting the child. VEDANTAM: Let's go back to Katrina Doudna, our 3-year-old maestra who's throwing a fit because she can't sit at the head of the family's circular dining table. VEDANTAM: Dad tries to reason with her. DAVID DOUDNA: Do you want to sit at? Do you want to sit - do you know what? It doesn't have a corner 'cause it's round. It's a circle. VEDANTAM: James Green says that he's fallen into the same trap before. GREEN: When children are at the peak of anger and they're screaming and they're kicking, probably asking questions might prolong that period of anger. VEDANTAM: Dad decides to intervene. D DOUDNA: I'm going to pick this chair for you. KATRINA: (Screaming) No, no, no. VEDANTAM: ...Slams it against the wall. VEDANTAM: It seems like things are escalating, but James says it's just the opposite. GREEN: Once she's thrown herself on the floor and thrown something or, in this case, knocked the chair against the wall, we're probably on the down slope of this tantrum. She's spent a lot of energy screaming, yelling and now doing these physical behaviors. VEDANTAM: Listen to Katrina, and pay attention to how the register of her voice changes. KATRINA: (Screaming) No. (Sobbing) No. (Screaming) No. VEDANTAM: Mike says, in many cases, parents can safely ignore their child's tantrums. POTEGAL: And this approach has a formal name - planned ignoring. And it basically means turning your back on the child and walking out of the room because talking to them and telling them to stop is giving them attention, albeit negative attention. POTEGAL: A very different approach is appropriate. And the reason for that is that what the tantrum does is basically a stall. It's a way for the child to not comply with the parent request. And so the best approach, if it can be managed, is to get the child to comply with the request. For younger children, this can be done with a hand-over-hand kind of forced cooperation. So you can say to the child, OK, get your PJs on. And if the child refuses, you can say, OK, I'm going to count to three or five or whatever you like, and if you have not begun putting your PJs on, I'm going to put my hands on your hands and help you do it. And children really do not like this. VEDANTAM: Because, he says, it's a threat to their autonomy. And if the child still doesn't comply, maybe you can use it as an opportunity to do some research, just like Mike. POTEGAL: We would walk down the street, and I'd see a kid having a tantrum, and I would mutter or say out loud to my wife, data. And then, of course, she'd give me a sidelong look about (laughter) what's wrong with you (laughter)? VEDANTAM: We've talked so far about the secret languages of dancing and babbling. We've looked at the grammar of temper tantrums. Now, we turn to lullabies. VEDANTAM: Laura Cirelli, the first researcher we featured on dancing and synchronization, has also done work on the language of music with infants. CIRELLI: Across cultures, we all engage with music, and we do it at such an early age, so we really wanted to continue to explore this idea that one of the real benefits and perhaps one of the underlying reasons why we invest so much time and energy in music across cultures is because of these social and emotional implications. VEDANTAM: Remember the magic of the clean up song that Laura talked about earlier? She and her fellow researchers wanted to closely examine the effect of music on babies and their caregivers. They asked parents to volunteer to come into the lab with their babies. Thirty mothers said they would do it. CIRELLI: They would be in a soundproof room, and babies would be sat in a little highchair, and moms would sit facing them. VEDANTAM: They were also measuring stress levels. CIRELLI: So we used little stickers on the bottom of the baby's foot and on the mother's fingertips, and what we're able to measure with this is actually their sweat gland activity. CIRELLI: ...Both Mom and baby's arousal levels decreased as the song progressed. So what this is telling us is that lullabies are really working to calm not only baby but also the mother. And so this supports this idea that there's a function here. VEDANTAM: Is this telling us just what our - is this just confirming what our intuitions are telling us or do you think it's telling us something more than that? CIRELLI: Anecdotally, I'm sure most parents would agree that lullabies soothe their babies. But usually, when we're singing lullabies to our babies, we're holding them and we're rocking them and we're adding all of this really important, soothing tactile information. So we wanted to know what the song is doing, removing all of that tactile input. CIRELLI: So the babies are sitting in a highchair. They're facing their mom, but they're not experiencing that holding and that rocking that typically comes along with lullabies. But I think the really interesting thing here is we usually think of that unidirectional relationship. Like, when moms sing to babies, it is to change the baby's behavior. But I think it's - the really new, interesting thing here is considering how it's also affecting the mom. VEDANTAM: Indeed, if there's one thing that all this research shows, it's that communicating with babies is not a one-way street. Parents and caregivers are shaped by what babies say and sing and scream, just as babies are hungrily soaking up information from adults. When we think about raising a human, it's natural that most of us think about the role that adults play in shaping their children. What's less clear - but what is abundantly true - is that babies are every bit as involved in raising humans of their own. It's not just a figure of speech. We're all always growing up. VEDANTAM: When we come back - why less is sometimes more when it comes to helping children learn. 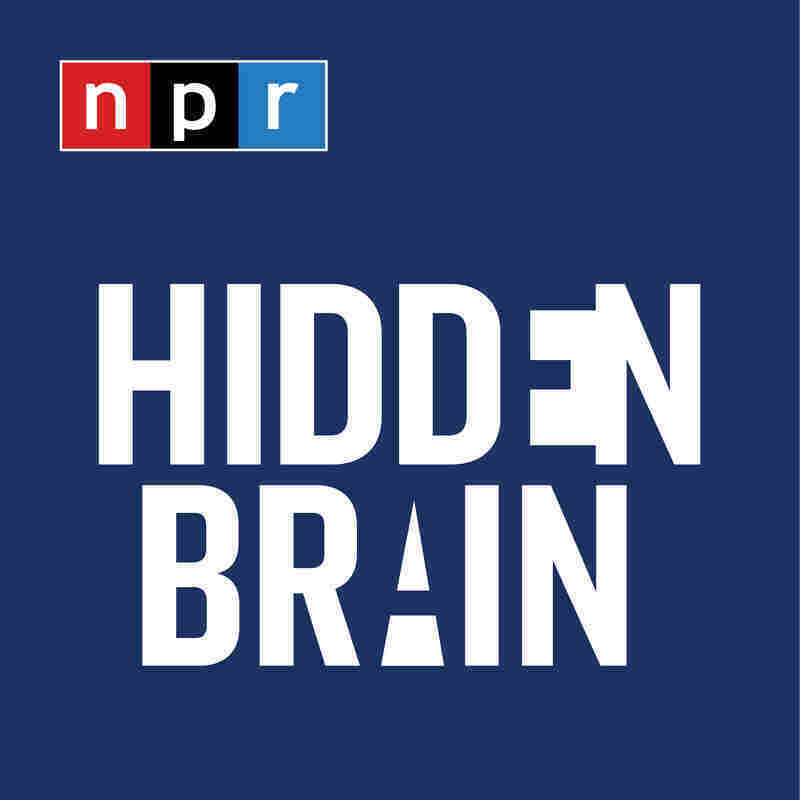 You're listening to HIDDEN BRAIN. I'm Shankar Vedantam. This is NPR. VEDANTAM: This is HIDDEN BRAIN. I'm Shankar Vedantam. Step into the basement of Alex Hamilton's (ph) home in Frederick, Md., and you'll notice it has a distinct smell. ALEX HAMILTON: It's wood dust and cigars (laughter). VEDANTAM: The wood dust, that's from his carpentry projects. Alex's basement is his workshop. He's built things for every room in his house and outside, too. Alex is showing my producer, Rhaina Cohen, around. Today, he's building something for a beloved family member. HAMILTON: One of my dogs likes to go with me everywhere, so I'm making a bike seat just for her. VEDANTAM: Alex calls himself a retired perfectionist. HAMILTON: Things don't have to be perfect for you to enjoy them. VEDANTAM: That's especially true for another of Alex's hobbies. HAMILTON: The garden is out here. VEDANTAM: He steps outside his house to show us. A sausage of a dog scampers up. HAMILTON: Butterbean (ph) - that's my garden helper. VEDANTAM: Alex walks around his garden pointing out the fruits and vegetables he's planted. VEDANTAM: ...Artichokes - maybe not artichokes. HAMILTON: I had one artichoke plant, and there was a rabbit who kept eating it down to the ground. And a couple weeks later, it would grow to be 2 or 3 inches tall. And then the rabbit would come back and eat it all the way down to the ground - so good for him. I still haven't seen what an artichoke plant looks like (laughter). VEDANTAM: This pesky rabbit is one of the variables that distinguishes Alex's gardening from his carpentry. When he's in his workshop, there are things that he can control. HAMILTON: The humidity, the shape, the size, the color. VEDANTAM: But as a gardener, he's found he has to let go. HAMILTON: You can't control the weather. You can't control your rain. You can't control the humidity. So I would say, more than half of the variables for gardening, you have absolutely no control. HAMILTON: You have things that creep up on you all the time. VEDANTAM: Surprises are what make gardening so frustrating. HAMILTON: Those weeds are really awful. I hate those things. VEDANTAM: But surprises are also what make gardening so rewarding. HAMILTON: All these flowers here started from one flower and they propagated. So at the end of the summer, we had this beautiful flower bed, and we didn't have to do anything. VEDANTAM: Alex Hamilton's hobbies are a metaphor for something very different. According to Berkeley psychology professor Alison Gopnik, the different philosophies of the carpenter and the gardener play out every day in how parents interact with their children. In her book, "The Gardener And The Carpenter," Alison looks at two approaches to being a parent and their consequences. Your book is built around an analogy - parents behaving like gardeners, parents behaving like carpenters. Unpack those analogies for me. GOPNIK: Well, if you look at the prevailing culture of parents and caregiving in the United States, it's a picture that's a lot like the picture you might imagine if you thought about a carpenter. And the idea is that if you just do the right things, get the right skills, read the right books, you're going to be able to shape your child into a particular kind of adult. And that picture is very different from the kind of picture that comes from the science. The picture that comes from the science is much more like being a gardener. Now, one thing about being a gardener is you never know what's going to happen in the garden. The things that you plan fail, but then wonderful things happen that you haven't actually planned. And there's actually a deeper reason for that. And the reason is that what being a gardener is all about is creating a rich, nurturant but also variable, diverse, dynamic ecosystem in which many, many different things can happen and a system that can respond to the environment in unpredictable kinds of ways. And I think the science suggests that being a caregiver for human beings is much more like being a gardener than being a carpenter. It's much more about providing a protected space in which unexpected things can happen than it is like shaping a child to come out to be a particular kind of desirable adult. VEDANTAM: I was surprised to read that the term parenting itself isn't very old. When did the term become popular, and how did it come to be? GOPNIK: Yeah, it's interesting. The very word parenting, which seems so ubiquitous and taken for granted now, is actually quite recent. So if you look in Google Ngram, it's only around the 1970s in America that the word first begins to really take off. And then there's this kind of exponential increase from the '70s up to the present moment. UNIDENTIFIED PERSON #3: This is "Focus On The Family," hosted by psychologist Dr. James Dobson, the author of such best-selling books on the family as "Parenting Isn't For Cowards". UNIDENTIFIED REPORTER: Amy Chua ignited a firestorm by sharing the surprising details of her strict parenting methods in the book "Battle Hymn Of The Tiger Mother." GOPNIK: And if you think about it, parenting is a kind of strange word. After all, we don't wife our husbands or child our parents. What we say is that those are relationships. I am a child, or I am a wife. It's not a kind of goal-directed activity that I'm doing that has a particular outcome that I'm trying to achieve. And I think being a parent is a much better way of describing what that relationship is all about than parenting - than changing a child into something else. VEDANTAM: So it's interesting that that switch in some ways to a verb, it changes what we think about the activity. As you say, we don't sort of start a friendship saying, in three years' time, I want my friend to become X, and I'm going to raise my friend to become that person that I want him or her to be. GOPNIK: Yeah. In fact, if you think about something like a friendship, of course, it's when friends are in bad shape that the friendship counts the most. I think there was actually a historical reason why the word appeared in the late 20th century and the culture that goes along with it, which has become more and more intense, even in the 30 years since I had my own children. And I think that reason is that for the first time in human history, people were having children - especially, you know, middle-class American people - who had not had much experience of caring for children before. So one of the things, again, that comes out of the science is for as long as we've been human, older brothers and sisters and cousins and aunts and grandmothers and the whole village has been involved in caring for children. And that meant that for most of human history, by the time you were ready to have children yourself, you'd had lots of practical experience in caring for children. You'd also watched lots of different people - not just your own parents but many other people - care for children. And what happened in the 20th century was because families got smaller, and people got to be more mobile, and people had children at a later age, for the first time, people were having children who hadn't had much experience of caring for children but had had lots of experience of going to school and working. So I think it was kind of natural for people to think, oh, OK, this thing that I'm about to do - this is like going to school and working. And if I just - if I can just find the right manual or the right secret handbook, I'm going to succeed at this task the same way that I succeeded in my classes or I succeeded at my job. So I think that historical fact is a lot of the reason why this culture - and with it this kind of sense of anxiety and worry and also this billion-dollar parenting industry - all started emerging at the end of the 20th century. VEDANTAM: Alison points out that compared to other primates, humans have an especially long childhood. GOPNIK: We just sort of take it for granted that children need to be taken care of for a long time. But that's actually sort of evolutionarily paradoxical. And there's an interesting question about why did that happen. And one idea, at least, is that having that long period of childhood gave you this protected period where you could figure out a new environment. You could move, say, from one village to another or from one place to another. And childhood gave you a chance to master that new environment. And I think that a lot of the things that seem kind of strange about children - the fact that they're simultaneously so creative, so imaginative, so exploratory and yet so bad at taking care of themselves - kind of fit that picture. VEDANTAM: What do you think the harm is of parents trying to be carpenters? GOPNIK: Well, I mean, it's a tricky question. I think the main harm is that it makes the process - the life of being a parent - anxious and difficult and tense and unhappy in all sorts of ways that are unnecessary. And I think it makes it that way for parents, and it makes it that way for children. Now, the question about how any kind of behavior on the part of parents influences children in the long run is very, very complicated. So another piece of this evolutionary picture is that every individual child has their own characteristics. Every parent does. There's this complicated interaction between the parents' distinctive characteristics and the child's so that actually trying to say, well, if you do this, then your child is going to come out like that in the long run, that's pretty much a mug's game. And I don't think we have very much evidence for that. So I wouldn't want to say, ah, well, if you're a carpenter, then your children are going to come out to have some terrible, crazy feature. Children come out in all sorts of unexpected ways. That's the whole point. VEDANTAM: It's not just that the carpentry model is making parents and kids stressed. There's something Alison has noticed about today's adolescence. GOPNIK: You know, in some ways, they're doing much better. They're achieving more, they're less likely to get pregnant or to use drugs. But that goes with a kind of anxiety - high levels of anxiety, high levels of fear. And I think that is kind of what you would predict from the carpentry story. So the carpentry story is one where you're so concerned that the child come out that you're not giving the child the freedom to take risks and explore and be autonomous. And it's not risk-taking unless there's some chance that it could really go wrong, and I think that's another aspect of the current parenting culture that's problematic. We're so concerned about how these children are going to turn out that we're unwilling to give them the autonomy that they need to be able to take risks and go out and explore the world. VEDANTAM: So I'm wondering if some of this has to do with what your goals are as a parent. The point that I think you're making is that by creating an environment where children can learn and explore, you build children who perhaps are going to be less anxious, more resilient, more able to deal with the vagaries of life in front of them. And I get that, and that does make sense. But there's also the case that I think our world rewards people who can do very specific things and do them very well. So, you know, every four years, the Olympics comes along. When I see people who are winning gold medals in the Olympics, you know, those are usually kids who've started ice skating lessons when they were 3. Or you see someone who was joining the orchestra in your town, and that's someone who has started, you know, piano lessons when she was 4. And there are these very specific skills that I think are very hard to learn and take an enormous amount of time and dedication and practice. And if you don't actually invest the time to do that early, it becomes very hard to master those skills later on. And even though you might say, you know, let the child figure out what it is he or she might want to do, if a child discovers that she really wants to be an ice skater or a ballet dancer when she's 14, it's probably too late at that point to really be very good at it. And I'm wondering if some of the tension here comes from what it is that we're actually aiming for. Are we aiming for children who are well-adjusted versus aiming for children who are successful? And I wish there wasn't a tension between those two things, but I sometimes think there might be. GOPNIK: Well, it's interesting. You know, there's no question that part of the kind of cultural background for the parenting approach is this sense that parents have of being in a very competitive universe where, you know, small advantages to their children in terms of their education, for example, are going to be absolutely crucial to make sure that the children continue to be in the middle class or the upper-middle class. The combination of increasing inequality and increasing relationship between that inequality and things like academic achievement I think puts a great deal of stress on middle-class parents to make sure that their children get into that academic achievement track. VEDANTAM: The very moments when parents think they're helping their kids learn, they may in fact stand in the way. Alison described an experiment that shows just what happens when adults take the lead or hang back. GOPNIK: This is work that was done by Elizabeth Bonawitz and Laura Schulz, and what they did was they showed the children this complicated thing that could do lots of different things. It could squeak, had a mirror, it had a light. And the question was, would the children discover all the things that the toy could do? And what they found was that if you gave a complicated toy like that to a 4-year-old, as you might expect, that 4-year-olds play and they find all the things that it could do. But when the experimenter just changed what they said - this is my toy, I'm going to show you how it works - and did one thing like squeak the squeaker, the children were much less likely to explore. What they did, sort of rationally, was squeak the squeaker, did what the adult had demonstrated and suggested to them. And we have a number of different results that are like this where children are very, very sensitive to quite subtle indicators that someone's being pedagogical, that someone's being a teacher, and that has some advantages that narrows down the number of options they're going to consider. But it can also have disadvantages in terms of the range of exploration that they're willing to consider, too. VEDANTAM: Now, of course, play itself can be a form of learning, and one way to think about the importance of play is to think about artificial intelligence and how play informs the way we train robots. You talk about this idea in the book. How are researchers using play to help robots learn, and what does that tell us then about the science of raising kids? GOPNIK: Well, it turns out that a very good way of getting a machine system to learn is to give it an early period where it can just play. It can just try out lots and lots of different options and get a lot of information about how the system works. So for example, they designed a robot that had a period early on where it could just kind of dance around in this kind of weird, funny way without actually trying to do anything in particular. And it turns out that if you gave a robot a chance to just dance around, figure out what its limbs could do and then you gave it a specific job, like, you know, go and pick up this piece of cloth, the robot was more resilient if it had had a chance to play. And this is one of the interesting things about play. I think everyone has kind of the intuition that play is important and valuable. But, of course, if you actually want to have a specific outcome, like a particular score on a test, you're always going to do better if you don't play, if you just have very specific instruction. But if you want that knowledge to be resilient, if you want someone to be able to be flexible, to say, OK, I didn't learn how to do this particular thing, but now can I apply what I did to something else, then play really seems to play a deep role. So for the robots, for example, the robots who had played, you could take off one of their arms or you could tip them over, and they would still be able to figure out how to reach for the cloth. And that was not true for the robots who had just been trained on that particular action. And I think that's a good model for the things that play can do in general. VEDANTAM: So you were once in the kitchen with your grandson, Augie, and you were whipping egg whites for pancakes. And I understand your grandson was imitating you but not quite doing it the way you were doing it. Tell me what happened. GOPNIK: (Laughter) One of the great joys of life is cooking with 2 and 3-year-olds, and they love to cook. But, of course, they're extremely inefficient at the same time. So, you know, when Augie's whipping egg whites, the egg whites end up having egg white fresco all over the walls, and he's doing it in a way that is not nearly as efficient as it would be for me to do it myself. But it's interesting that if you look across cultures, what caregivers often do is not give their child instructions on what to do but let them participate, so let them take on a piece like whipping the eggs. VEDANTAM: Alison and I had mostly focused on how young children learn, so I asked her to talk about older children. She said that whereas younger children learn well through play and exploration, older kids learn best through an apprenticeship. They imitate. They practice. They get critiques. But most schools teach in a very different way. Alison gave me a thought experiment. GOPNIK: So imagine we taught baseball the same way that we teach science currently. What we would do is we would have children read books about baseball rules. When they got to high school, we would let them reproduce famous baseball plays of the past, and it wouldn't be till graduate school that they would actually ever get to play the game. And that's pretty much the way that we teach science. It's not till graduate school that you actually ever get a chance to do science, as opposed to reading about science or reconstructing science. And, you know, especially with things like virtual reality and computer environments, there's no reason for that to be true. Children could be actually doing inquiry and doing experiments and doing science early on. And I think the same thing's true for things like writing, for example. Children learn about writing, but the way to write is to write with a good editor, to watch someone who's competent writing. I think our whole educational system could be oriented towards both exploration but also this kind of apprenticeship system much more effectively. VEDANTAM: I'm wondering if some of the tension between the gardener and the carpenter model comes down to the different things that societies have called on young people to do. So there used to be a time when we needed large numbers of people to join the industrial workforce, but increasingly I think we are looking to young people to do the kinds of things that are much higher-order skills. You know, I think the average futurist will tell you that in 20 or 30 years, you know, a college education probably isn't going to cut it because the kinds of skills that someone who's graduated from college can do will probably be done by robots. And so at that point you really need people who have much, much higher levels of skill. And I'm wondering if this is partly the tension between the gardener and the carpenter model because if you actually need people who don't just simply understand, you know, how to do a bunch of things in a factory but to understand much higher-order things, that requires a level of specialization and a length of training that is not just going to be acquired through exploration and play. It actually has to be acquired through sort of systematic and diligent training over very, very long periods of time. And is it possible that the way our society is changing is part of the reason why people are, you know, drawn to the carpentry model? GOPNIK: Well, I think that's the picture that people have. But again, what the science would tell us is just the opposite. So, you know, if you compare, even from an evolutionary perspective, you know, compare us to our closest primate relatives, we're not actually as good at doing specialized tasks often as other creatures are. What we're very good at is improvising and finding new ways of thinking about the world around us. Here's a new problem, I don't know how to handle it, what would I do - that's really the skill that we're going to need in the future. And the irony is that that's a skill that you can't learn by just trying to learn that particular skill. That's a skill that seems to come from a sense of freedom and exploration even in other domains. So I think we may be kind of suckered into thinking, well, if we want children or adults to succeed in this very unpredictable, variable world, what we need to do is give them higher and higher and higher levels of very specific academic skills. I think, you know, even if you go down to Silicon Valley near where I am at Berkeley, I think they get it. So, you know, famously, Google gives their employees a day off to do whatever they want, and, you know, Pixar has playhouses as part of their environment. So I think the value of that kind of playful exploration is something that people, say, in the tech world get, but I do think it's in tension with the sense that this is so important, it has to be shaped and you want a particular outcome. So the irony is to get to good outcomes, sometimes you do better by not trying specifically to get to those outcomes and instead not worrying about outcomes at all. And I think that's one of the real deep messages of the science that I'm talking about in the book. VEDANTAM: Alison Gopnik is a professor of psychology and philosophy at the University of California, Berkeley. She's the author of several books about children's development, and her most recent one is "The Gardener And The Carpenter." Alison, thank you so much for joining me today on HIDDEN BRAIN. GOPNIK: Thank you so much, Shankar. VEDANTAM: This week's show was produced by Parth Shah and Rhaina Cohen and edited by Tara Boyle. Our team includes Jenny Schmidt, Thomas Lu, Laura Kwerel and Camila Vargas Restrepo. For more HIDDEN BRAIN, follow the show on Facebook and Twitter and make sure to subscribe to our podcast. I'm Shankar Vedantam. VEDANTAM: See you next week.